Mark graduated from Massey University in 2001 with a bachelor’s degree in Jazz performance. He has studied with known international performers and educators such as Henry Cole, Joe Morello, Ari Hoenig, John Riley, Jim Black, Andrew Gander, Felix Bloxman, Ben Vanderwal, Graham Morgan, Changuito to name a few. 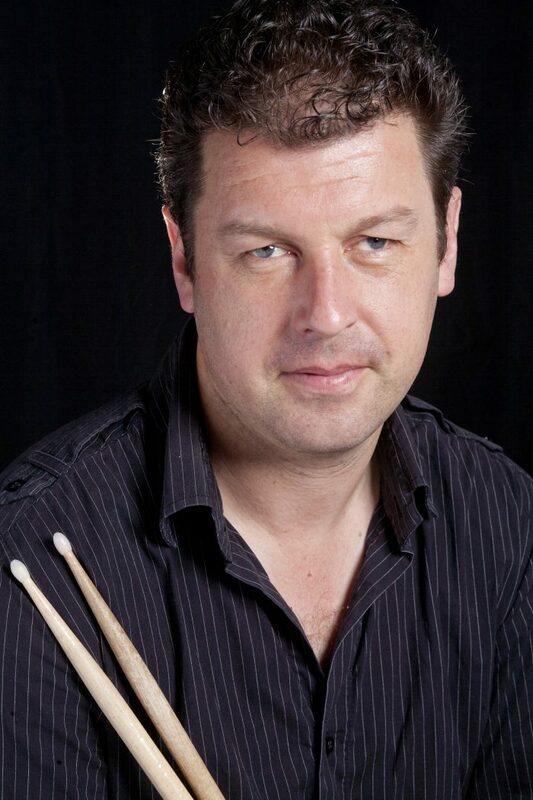 As a musician Mark formed the “Mark Lockett Trio” and “Mark Lockett and friends”. He has played with some of the finest American, New Zealand, and Australian musicians such as George Garzone, Roy Hargrove, Joe Cohn, Joel Frahm, Orlando le Fleming, Danny Walsh, Ratzo Harris, Roger Manins, Phil Broadhurst, Paul Dyne, Colin Hemmingson, Jonathan Grayford, Jeff Henderson, Richard Nunns, Michelle Nicole, Emma Gilmartin, Alison Wedding, Geoff Hughes, Mark Fitzgibbon and Jamie Oehlers. In 2004 Mark released his debut CD “About Time” on Move Records. This CD features special arrangements by Jordan Murray and Eugene Ball. Early in 2005 Mark released a joint project with saxophonist Paul Van Ross, titled “Mark Lockett + Paul Van Ross live at Spleen”. A series of regular weekly gigs were recorded at Spleen Bar and the highlights were released on New Market Records. Mark has also released ‘Now and Then’ and ‘Sneaking Out After Midnight’ (recorded NYC) which includes some of his original compositions. Marks latest release ‘Redaction’ (Rattle Records, 2015) is a collaboration with photographic artist Veronica Hodgkinson, taonga puoro expert Dr. Richard Nunns and free music improviser Jeff Henderson. As a drummer, I have two roles: as a teacher and as a performing artist. I consider my playing vital to my success as a teacher and my teaching an inspiration for my playing. My students are taught in a professional environment with an emphasis on having fun. Lessons are a combination of structured exercises from various teaching books, play-along CD’s and discussion around individual musical and creative development. Musical styles include Hip-Hop, Rock, Funk, R&B, Blues, small and medium combo jazz, Latin, Brazilian, and Afro-Cuban to name a few. Fortnightly in-person lessons: Suitable for student’s who are serious about their drumming. Lessons are tailored to student’s skill level and their desired outcome. Half hour in-person weekly lessons: One-on-one weekly lessons tailored to student’s individual skill level and desired outcome. Online program: available on teachable.com via my Drumlab website. Students may also subscribe to my Youtube channel Drumlab with Mark Lockett. Please click on the words “drum fills” for a link to a sample of a lesson on creating drum fills available on my Youtube channel. Buddies program: This program is suitable for two students to learn together and will be based on a set syllabus. Lessons are weekly 30 minute lessons for the duration of the school term. Students will have the opportunity to perform at an end of semester concert. Suitable for students between ages 9 to 15 years. NCEA booster program: Lessons will focus specifically on skills, technique and repertoire required to successfully complete NCEA course requirements. Lessons are weekly for 45 minute for the duration of the school term. Students will have the opportunity to perform with a live band in two concerts per year. Youth initiative program: This is a wonderful opportunity for drum students attending high school to apply for a scholarship to attend this course. Lessons will be scheduled for 3 days during the mid year school holidays and numbers will be limited to 3 students per program. This will be an intensive course tailored to student’s individual skill level and musical aspirations. Students are to apply through their high school for this program. Join a Jazz Band: This is your chance to join a jazz band that will rehearse for two hours once a week. Repertoire covered will be jazz standards from the great American songbook.